Apple released iOS 9.3.2 beta 3 this week, and coming just six days after the second beta release, it is clear that Apple is stepping things up in the development of its iPhone and iPad operating system. While new features aren’t really the order of the day here, bug fixes, security improvements and performance increases are what the doctor ordered and iOS 9.3.2 delivers. In fact, when it comes to performance, there is only one way to get a good feeling for just how quick new releases are when compared to the versions they are replacing, and that’s an exhaustive YouTube video comparing them. An iPhone 6s running iOS 9.3.2 beta 3 (right) versus one running the latest stable release, iOS 9.3.1 (left). It seems the former is faster to boot up. 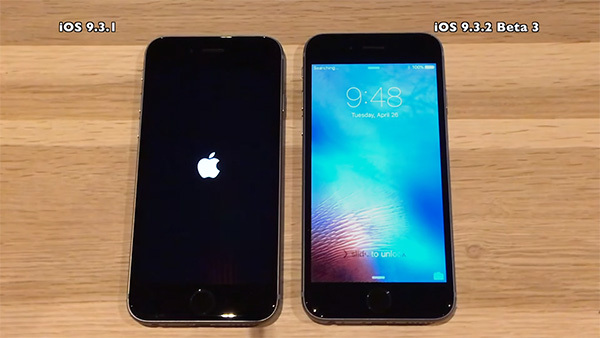 By taking an iPhone 5s all the way up to the iPhone 6s and running tests comparing final version of iOS 9.3.1 to iOS 9.3.2 beta 3, the YouTuber has been able to come to a conclusion as to whether those on the lookout for speed improvements alone should make the jump when iOS 9.3.2 goes live for everyone. When compared to the similar test conducted when beta 1 of iOS 9.3.2 was released, it’s clear that the latest iOS 9.3.2 beta has made some progress and is now noticeably faster and smoother than earlier 9.3.2 betas. Over a total of three videos, viewers can kick back and watch as iPhones duke it out on video. The results may or may not surprise you. Of course, there is no telling how well the final release of iOS 9.3.2 will perform when it becomes available worldwide, but it’s unusual for a final, stable release to perform worse than the beta releases that came before it. With that in mind, we’re fairly confident that what we are looking at in beta 3 is fairly close to what the final version will be like once it is released. You can watch all the aforementioned videos below. You desperate bafooon. Make up your mind. I’m still getting abysmal battery life. I charge my 6 and 6s Plus at night and leave in the morning, granted I give more use to the Plus but it use to last all day and then some, now it’s half-charged by midday and by 16:00 it’s dead. The smaller, older 6 is not on the beta. Plus there’s this issue that when I reject a call through my watch or in DND mode, my carrier sends me a message through USSD it freezes and nothing but a hard restart can get it out of it. You misquoted yourself?? Hahaha. You are on another level of stupid.